Today I'm off to Santa Barbara for time with a friend and to spend the weekend at a workshop with Michael Meade, a renowned storyteller, author, and scholar of mythology, anthropology, and psychology. The title of the workshop is "Facing Fate, Finding a Destiny." I had the opportunity to experience a brief workshop with Michael Meade several years ago and was enchanted by his storytelling (often while drumming), so I am very excited about this weekend. Although often treated as interchangeable, fate and destiny are two sides of an archetypal dynamic that shapes each life from within. An old idea identifies fate and the soul as the same thing, for fate includes the persistent limitations and distinct complexes of our psyche as well as the tangled threads of family and ancestry within us. Our destiny is also woven within, appearing as a bright thread of the soul's deepest intention and original purpose in coming to life. Fate is there at the beginning as each soul's seeded pattern, and fate is there at the end; fate is purpose seen from the other end of life. Fate appears in the curious twists that define a life and mark it indelibly while destiny is the only way through fate's exacting pattern. What begins as limitation or even fixation becomes the vital plot line of the soul's necessary story. Life's genuine callings involve the golden thread of destiny that grants us specific gifts and talents; but the unfolding of fate requires that we also handle our deepest wounds and unhealed traumas. Only in facing our fate can we find our deepest resources and the destiny the soul longs to know. 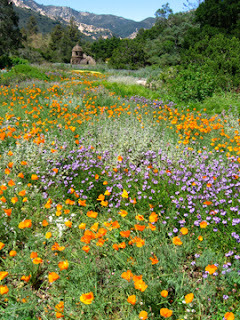 About the image: Toad Hall, Santa Barbara Botanical Gardens -- this is one of my favorite Santa Barbara pictures. How interesting! Have a wonderful trip and workshop. Hope your weekend is all you hope for and more!